This cozy house has been renovated with modern facilities in a clean and homely style. You can enjoy beautiful river view from main bed room. This house is full of brand new facilities and Japanese style decorations, such as the fully equipped kitchen, shower room, modern toilet and basin. There is no bathtub in the house but a public bath house is only 1 min walk away. This is a recommended experience. This house is not a traditional town house (machiya). 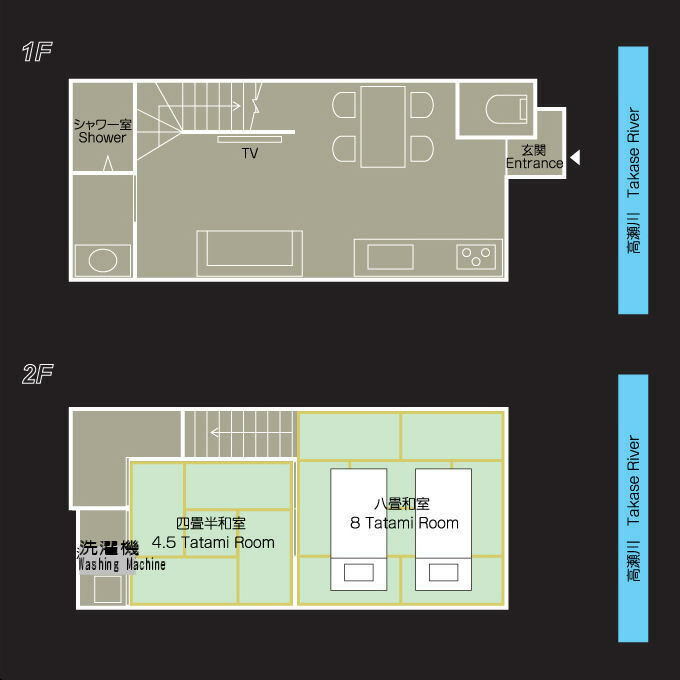 Bedding for 5 futons, Air-conditioner/heating in all rooms, Japanese style modern shower room. Luxury toilet, Free WIFI, Direct telephone line to the K's Villa office. *We do not provide night clothes/ pajamas, please bring your own.